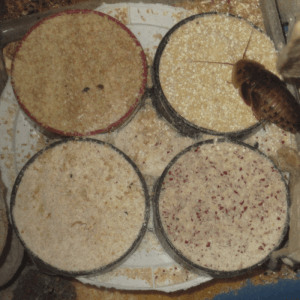 One of the most common questions we’re asked relates to Dubia roach diet. People want to know what to feed Dubia roaches. This makes sense because next to environment, dietary choices are among the most complicated and consequential roach-keepers make. Dubia need all the standard tropical roach accommodations such as heat, humidity, and darkness, but these elements are more or less binary. Roaches either get what they need, or they don’t. But nutrition is different. Diet options are infinite. There are as many ways for things to go wrong as right. What you feed your Dubia can mean the difference between healthy & unhealthy, productive & unproductive. Even alive & dead. Slight rhetorical embellishment aside, we thought we’d address these questions by creating a Dubia roach food diary of sorts. A “What Our Roaches Eat in a Day” post, if you will. In it we will upload information about what we fed our roaches each day for a week, starting with yesterday. Like most cockroaches, Dubia can survive on a wide range of food and food-like substances. They are generalist feeders. 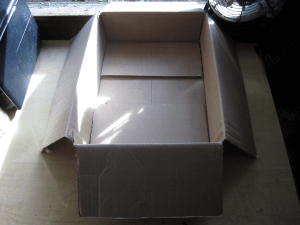 There are reports suggesting they may even be able to survive on paper and cardboard glue. However, how long and how well they live consuming such things is an open question. We don’t recommend feeding these that stuff to your Dubia. They’re obviously not normal fare for roaches in captivity or in the wild. Dubia evolved in tropical regions eating plant matter in various stages of decay, fungi, and probably dead insects or small mammal carcasses they stumbled upon from time to time. In the wild, their diet probably varies a lot. In captivity, people feed their Dubia a wide range of foods. 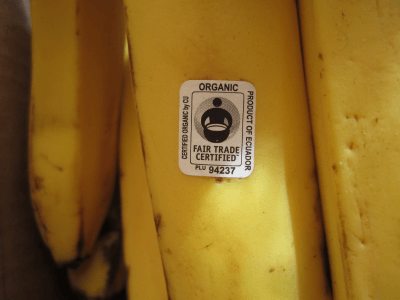 On one end of the spectrum are highly processed substances like dog food, cat food, cereal, fish flakes, etc. Perhaps these are dusted with vitamins or minerals like calcium before they’re offered up as feeders. One would hope! On the other end of the spectrum are fresh, raw foods like those found in the produce aisle of the supermarket. And knowing how many people keep Dubia roaches, there’s probably no shortage of stuff in-between. Whatever you choose to feed your roaches is fine by us. We aren’t here to judge. However, we’ve done a ton of research and experimentation on the ideal Dubia roach diet with respect to growth and productivity. That’s our business, after all. We’ve found that some foods (and feeding strategies) work better than others. While we won’t give away all our secrets here, we will try to give you a sense of what Dubia roaches eat generally, what our roaches eat specifically, and what you can (and probably should) feed them to achieve and maintain good health, vitality, and superior nutrition as feeders. 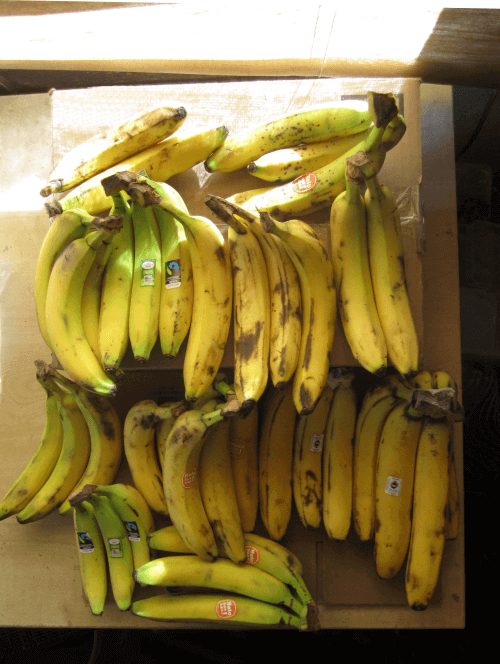 Ripe bananas are great Dubia food. 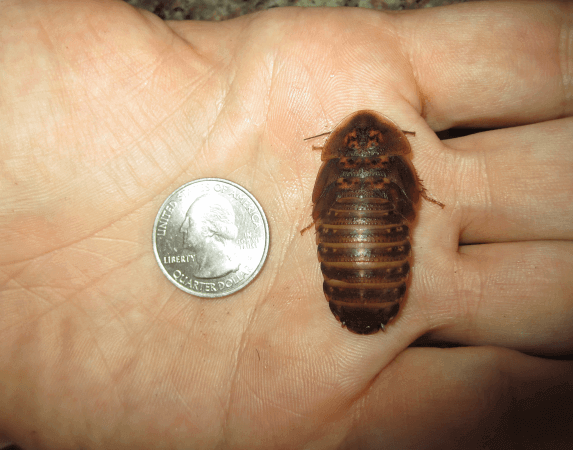 They’re relatively inexpensive, available year-round in the United States, and are high in the sugars Dubia roaches love. Their natural diet includes fruit, if they’re lucky. We have little doubt that fruit contributes to good roach health. In fact, to some degree we think the more fruit the better. We prefer organic produce for all our roaches when practical, but when not, we at least wash all produce thoroughly or peel it (if applicable). On the other hand, our organic roaches always get organic food, by definition. 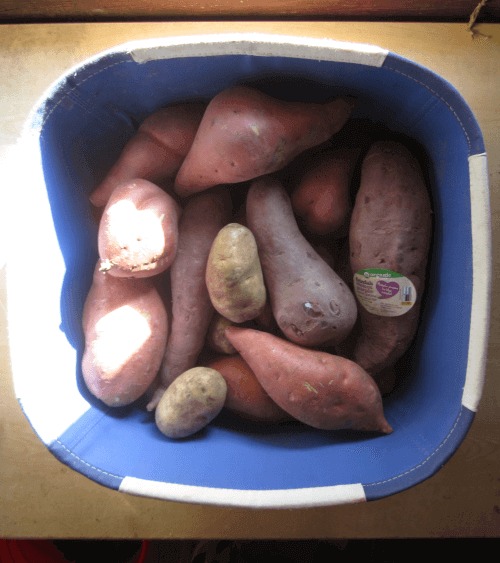 Potatoes (particularly sweet potatoes) are a nutritious source of calories for humans and animals alike. Roaches are no exception. 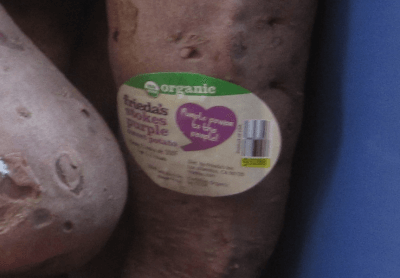 If sweet potatoes are good enough for NASA (external link), they’re good enough for our roaches! Even plain white potatoes are themselves nearly a “complete” food (external link), believe it or not. They contain most of the nutrients both humans and Dubia roaches need to not just survive, but thrive. Carrots and beets contain a range of nutrients including vitamins, minerals, polyphenols, fiber, sugars, and moisture. They are an important staple of our Dubia roach diet for several reasons. First, our roaches like them…a lot. Second, they’re among the dozen or so foods that may actually improve Dubia roach health and vitality, based on our experience. We’ve experimented with many dozens if not hundreds of foods over the years to find the ideal Dubia roach diet. In the fresh produce department, beets & carrots are strong favorites. 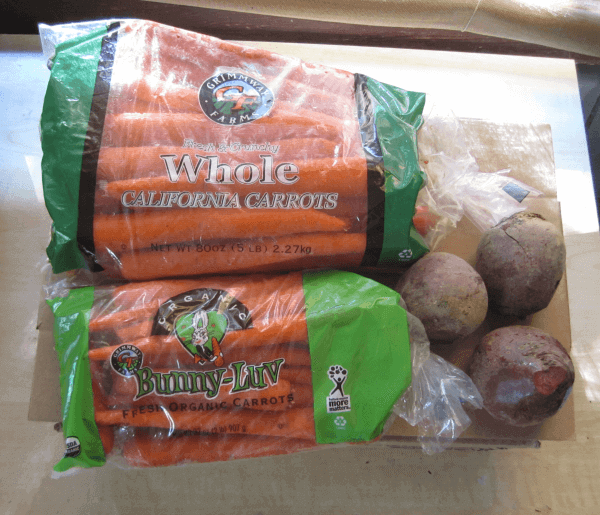 As you may have guessed, fruits and vegetables are important components of the Dubia roach diet. They aren’t the only important thing, as you will see tomorrow, but they are significant – both in volume and effect. 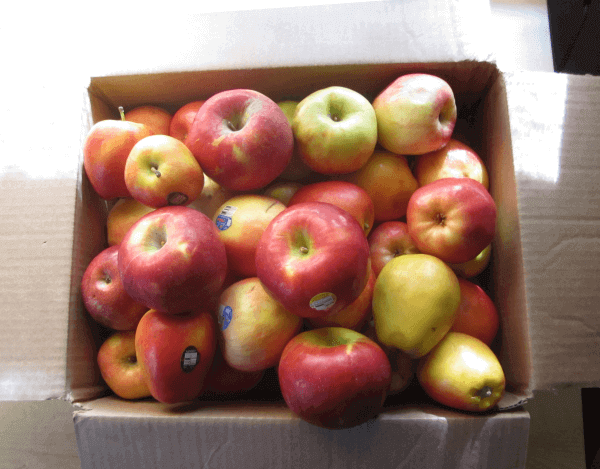 Apples contain many of the nutrients Dubia roaches need for good health. Natural sugars, vitamins and minerals, and phytonutrients among them. 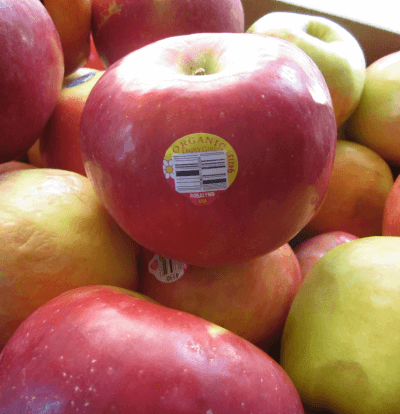 Like much of the fresh produce we feed our Dubia, apples are convenient roach cuisine because they’re available year-round. Some noteworthy advice about apples: Peel them before feeding to roaches. 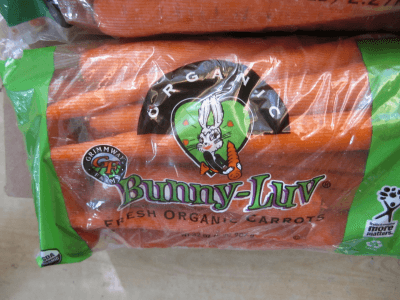 They’re high on the “Dirty Dozen Produce List” (external link), so we suggest peeling & coring them to avoid pesticides, wax, and whatever else might be lingering on their skins. And as usual, we have organic fruit for our organic roaches. AKA: This is where the magic happens. OK, so fruits and vegetables are important components of the Dubia roach diet, but we’ve found that they do better with more. Pictured is our Maximum Nutrition Everyday Roach Ration mixed with a bunch of super-secret ingredients to form about 45 pounds of “special sauce”. Actually, the rest is in a big bucket off to the side. We took a certain artistic license for presentation because as it turns out, huge buckets-o’-roach-slop aren’t very photogenic. It’s a good thing roaches live in the dark and lack human dietary sensibilities. Once you move beyond its unsightliness, our roach chow concoction is a beautiful thing. And Dubia roaches love it. They eat it up in mere minutes. Apples…meh. Bananas…OK. But MNERR? Our roaches go so thoroughly crazy for it that you can hear their stampeding feet from the next room at feeding time with the door closed. This is actually true. And they better love it. If they didn’t, we wouldn’t be doing our job. We’ve put a ton of effort over years into researching and developing “the best roach chow”, and we’ve adapted it to not just their needs, but also their tastes. We believe MNERR is a big part of our (and our roach’s) success. Don’t worry. You aren’t missing anything. It’s OK to skip feedings. It may even be productive, depending on your goals, what and how you skip, and how much you feed your roaches. All things equal, many animals in the wild don’t have constant access to food. As a result, they may have evolved certain beneficial coping mechanisms (pdf) (external link). And these adaptations may serve you, too. Some people may want their roaches to live longer. Others may want them to grow faster, or produce more. Whatever you goals, these things are all within the realm of possibility. So for us, some days without feeding our Dubia roaches at various stages of development is by design, so to speak. However, the how, why, and how often we do it is a trade secret! And naturally, we spare no expense or effort to accommodate our organic roaches. We usually feed our roaches oranges, but on this day we got a great deal on tangerines. 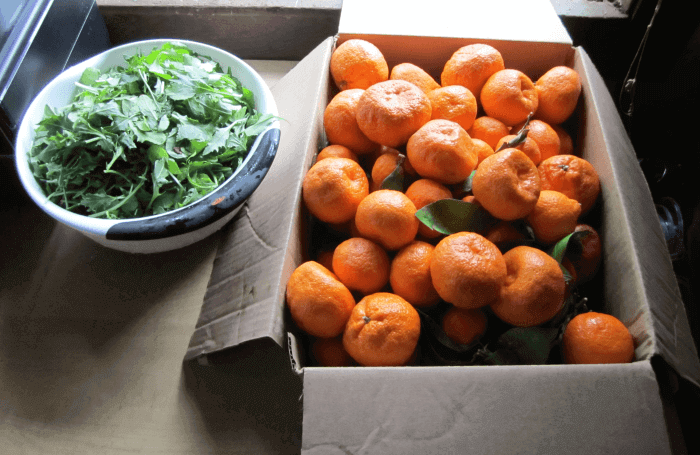 Organic tangerines, no less. We also picked up some mixed greens because that’s just how we roll! Dubia roaches love oranges specifically, but they are often picky about citrus generally. They like it sweet, not sour, and certain fruits more than others. Our rule of thumb is to feed citrus no more than once or twice in a week. This is probably a good rule for most feeder insects because some reptiles get upset stomachs after eating roaches and other insects loaded with citrus fruit. Once a week is fine. Any more and you should keep a close eye on your animals for ill effects – especially the sensitive ones. Chameleons come to mind, and maybe geckos too. And there you have it – a typical dietary “week in the life” of our Dubia roaches. Of course, we change things up all the time. We choose seasonal fruits and vegetables when possible and are always on the lookout for sales and local specials. We offer our roaches “snacks” if we come across something awesome at the farmer’s market, a distributor, or wherever. And, we’re not afraid to experiment. With a few exceptions, we aren’t rigid about what we feed our Dubia. We do consider some food items staples, and we insist on some things we think Dubia roaches shouldn’t do without, but we’ve also had reasonable success with variety, and we urge you to give that a try! Hello! 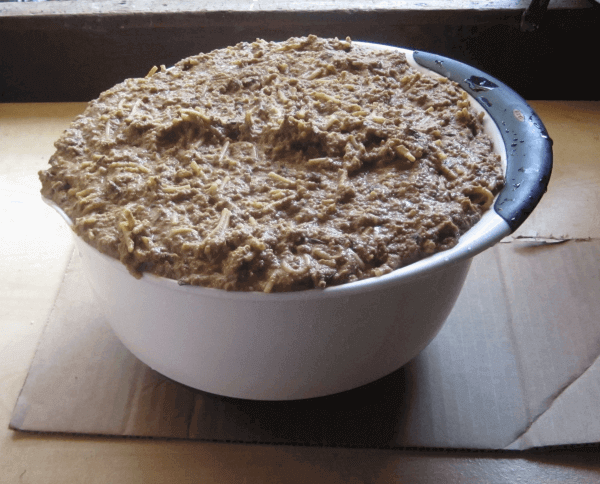 I’m new with my colony and I was wondering how to make the wet chow? Also what do you do for water supply? I do crystals but someone told me that was bad? Please help??? Also seems the wings of some of my bugs look like the have been ate on ? Ah yes – our secret roach chow recipe. So what I will say is all you need to do is add water to the consistency you want. You could make the chow more runny to provide more hydration. Just make sure you have a food dish that can handle moisture and clean out any leftovers daily. Or, you could make the chow consistency more on the dry side if the wetter version tends to cause a mess in your colony, and if your roaches don’t need that much hydration. 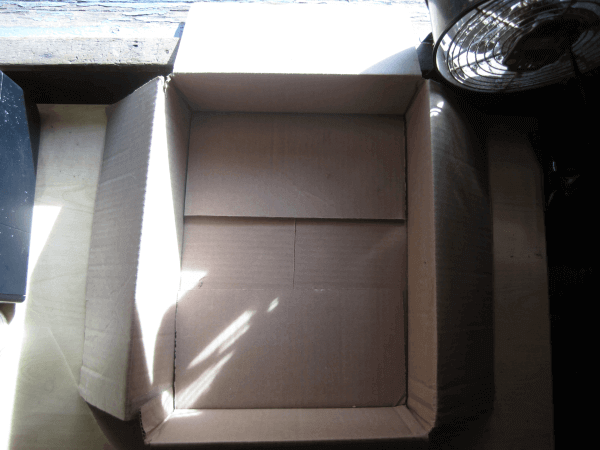 How you ultimately make your roach chow will depend on the situation in your colony or colonies. In case you’re wondering how to start: You might try easing into it with a drier mix of chow and water while continuing to supply water crystals on the side. This allows you to monitor the hydration of your roaches. Try to get a sense of the driest “wet chow” you can make where the roaches stop consuming the water crystals. You might consider that point the minimum “wetness” you need to make the chow in order to supply enough water. Otherwise, it’s entirely up to you. As long as your roaches have adequate hydration, you can make a wet roach chow according to your own preferences rather than theirs. Awesome!-ish ;) Preparing is half the battle. How do you prepare your fruits and vegetables? Does it all get sliced? Do you just cut the banana in half and throw it in the bin? orange peels? The stems on the greens? While I definetely have my own system, it would be nice to see some clarity from other Dubia breeders. Additionally, I’m out of dry rations and, well, so are you. If I can’t get it from you are you willing to share the recipe? I really want to take great care of the dubias for our bearded dragon and I’m finding dry food to be the biggest obstacle. We peel everything and slice up large items like apples. There is no right way to do it though. Whatever works for you will work for the roaches. While we probably won’t give away our roach chow recipe any time soon, we do plan on selling it at some point in the future. To get a notification when it’s in stock, sign up for in-stock notification on the product page and you’ll get an automatic email as soon as it’s available. What do you think of adding a few drops liquid baby vitamins to the water when you make up the water crystals? Also I’ve heard a high protein diet is important as these are feeder insects. I have protein powder as I drink protein shakes. Can I sprinkle a bit of this on their food or would protein in this form be harmful? Both the vitamins and protein powder sound fine as long as the ingredients are safe for your animals. Dubia roaches are already high protein feeders, so you might want to be careful not to go overboard with even more protein. I am fairly sure the high protein diet will be unhealthy for the roaches, which is not a direct concern, but it does suggest caution is in order. Insectivorous animals evolved to eat both insects and whatever the insects ate. In the wild, insects generally do not eat a high protein diet. In fact, their diets are usually relatively low in protein. Are peaches a no no for dubias being gutloaded for leopard geckos? I’ve never heard that. If leopard geckos can eat peaches directly, I imagine they could also eat them second hand, as they would with a gutloaded feeder.